This post is sponsored by California Walnuts. All opinions are 100% my own. As always, thanks so much for supporting the brands that help support The Cookie Rookie! This BAKED BRIE RECIPE is A MUST at your holiday table! 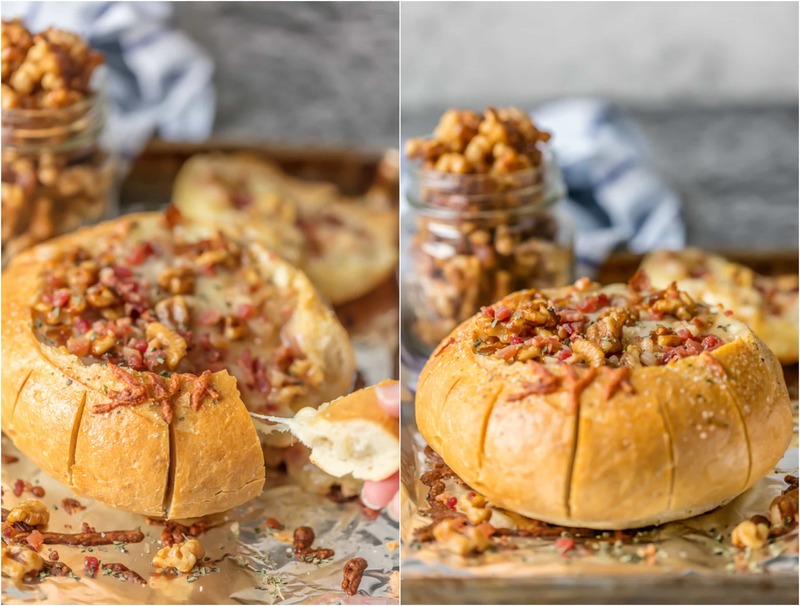 This Baked Brie Bread Bowl Recipe with Bacon and Candied Walnuts is the ultimate holiday appetizer that all cheese lovers will devour! A Baked Brie Bowl loaded with candied walnuts and crispy bacon is SO easy and full of flavor. Best easy appetizer recipe! 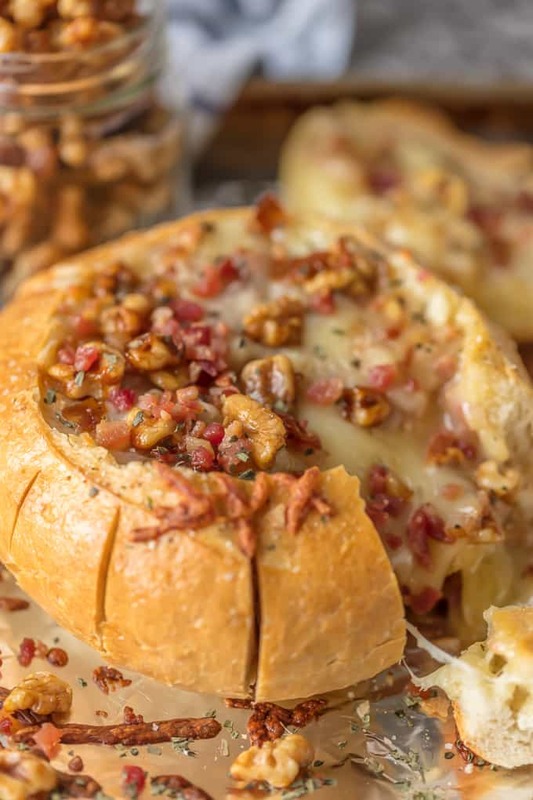 This Baked Brie Recipe with bacon and candied walnuts is such a beautiful and EASY Bread Bowl Recipe. This fun Baked Brie Recipe is a must make for any cheese lover! This melty, ooey gooey Baked Brie is served in our favorite Bread Bowls and loaded with crispy bacon and candied walnuts! The ultimate classy starter for any party, especially a holiday party, is here to make all your cheese lovin’ dreams come true. 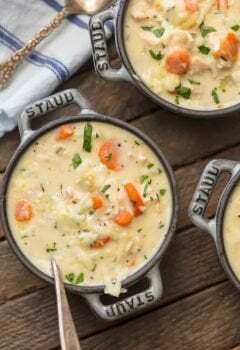 I have made recipes with brie before, both Apple Pie Baked Brie and Mini Apricot Brie Bites, but never have I made a cheesy recipe this decadent, easy, or fun. 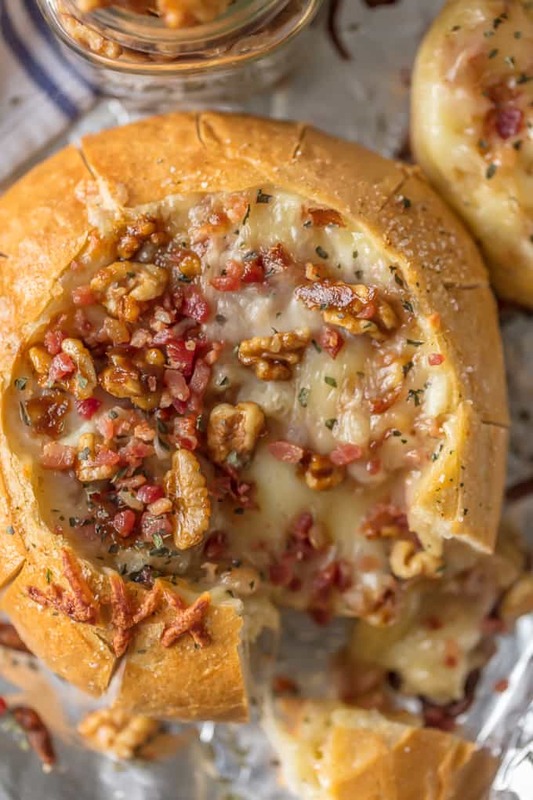 The difference that makes this Baked Brie Bread Bowl Recipe amazing may be that it’s piled with bacon and candied walnuts. It may be the crusty garlic butter bread bowl. Or it may all just work together perfectly for the most awesome holiday appetizer I’ve ever made. Are you ready? This Baked Brie Recipe is filled with bacon and candied walnuts! 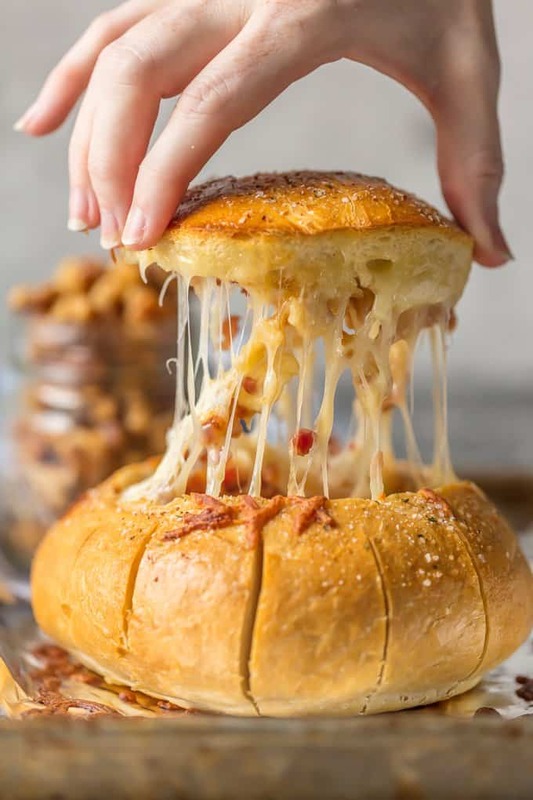 You’re going to love our Baked Brie Bread Bowl Recipe. This Baked Brie Recipe wouldn’t be complete without the Candied Walnuts! 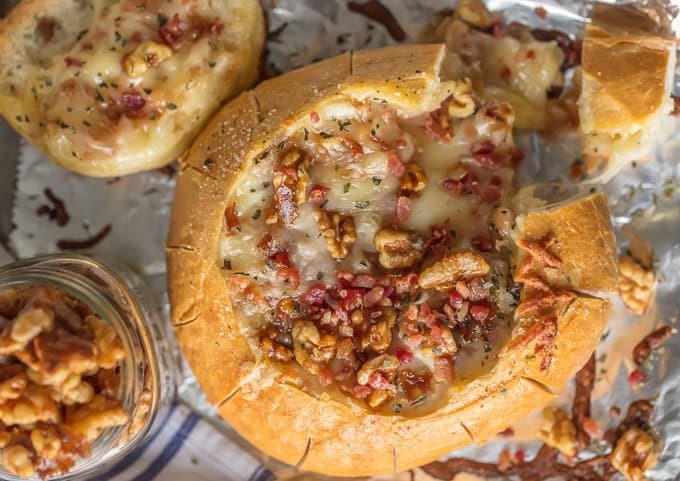 This Baked Brie Bread Bowl Recipe wouldn’t be complete without the Easy Candied Walnuts baked right into the cheese and sprinkled on top. Talk about DELICIOUS! 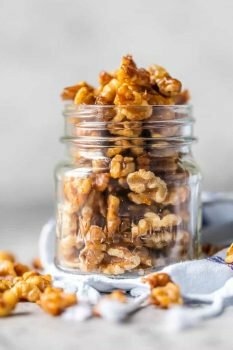 I’m so excited to be partnering with California Walnuts this year, and this bite sized holiday treat is my first of 6 recipes. I love their rich flavor and versatility. You can use walnuts as a flour in baking, as a topping in appetizers like this Baked Brie Recipe, as a relish or pesto, and SO MUCH MORE. It’s going to be a fun year coming up with some creative walnut recipes to bring you. YUM! 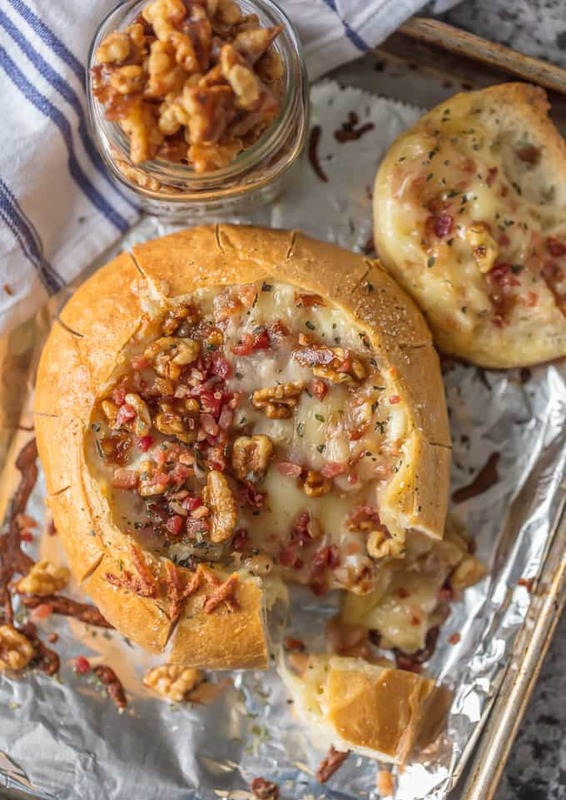 I love that this Candied Walnuts and Bacon Baked Brie Bread Bowl recipe is dip AND dipper in one. 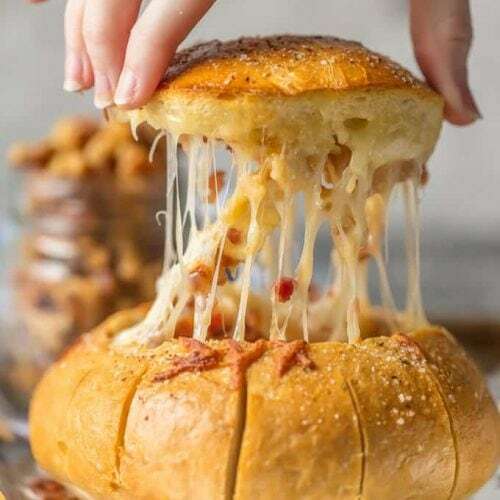 Just break off the pieces of bread and dip them into the melty pool of cheese sitting in the middle. Be sure to get lots of bacon and walnuts on your piece of heaven. You might want to make more than one of these for your next party! Do you eat the white part of Brie Cheese? You can! The white part of brie is called the RIND and its simply a dried and hardened part of the brie that has come into contact with the mould. It’s totally safe to eat and some studies show it’s good for your immune system. Win win! Can Brie Cheese go bad? Let the cheese air out for a few moments, and smell again. If the rind still has a slight smell, but the paste (the inside of the cheese) smells creamy, then the cheese is fine to eat. If the whole piece of brie still smells strongly of ammonia after a few minutes, the cheese has probably turned. How do you remove the rind from Brie Cheese? If you choose to remove the rind, you can simple hold the brie securely on a cutting board and cut the rind off one piece at a time. Be careful not to cut yourself. You can make this baked brie recipe with or without the rind. Can you believe the holiday season is here??! I CANNOT. Henry’s first Thanksgiving and Christmas. AAHH! It’s going so fast. I need to go eat more cheese to ease the pain. Give me all the baked brie with bacon and walnuts! 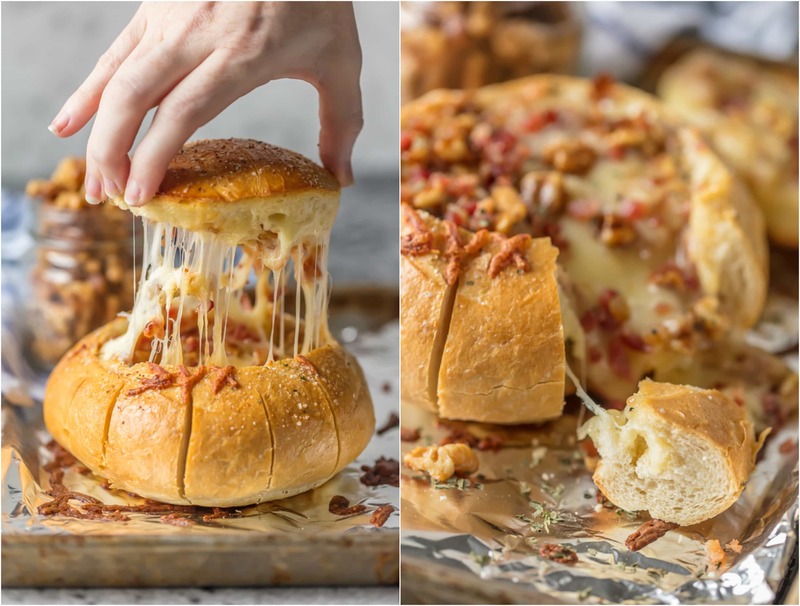 I can’t wait for you to try this Baked Brie Bread Bowl Recipe! It’s the best Baked Brie Recipe inside of a bowl of bread…what’s not to love? And with all that bacon and delicious candied walnuts in there, you might just get addicted. See the recipe card below to see full details on How to Make Baked Brie with Bacon and Candied Walnuts. Enjoy! Preheat oven to 350F. Line a small baking sheet with foil and set aside. Cut the top of the bread bowl off and set aside. Place the brie on the bread and use a paring knife to cut into the bread around the cheese (to create the hole for the cheese). Cut about an inch into the bread. Use your fingers to hollow out the hole for the brie. Use the knife to cut slits around the perimeter of the bread, but be sure not to cut all the way to the middle. Leave a bit of bread as to keep the shape in tact. You will tear off these pieces later to dip into the cheese. Mix the melted butter and garlic salt in a small bowl. Drizzle the butter over the bread bowl, onto the sides and into the middle. Sprinkle with more herbs if you have favorites. Set the brie down into the bread bowl (make sure you've removed the casing). Top with the walnuts and bacon and then mozzarella. Top with the top of the bread. Bake for 20-30 minutes until the bread is crispy and toasted and the cheese is fully melted. Once you remove the top, you can garnish with more walnuts and bacon. Tear off the side pieces of bread and dip into the cheese for the perfect appetizer! Do you have to take the rind off? I like brie with the rind.maybe i could scrape the majority of it off but still keep a little?? Recipe looks so good. By some chance do you know what size Brie you use. There are small and large wheels. Thank you so much for getting back to me!! !